There are people who find it hard to gain weight. Some even had to enroll to gym classes and purchase variety of weight gaining supplements that could be pretty expensive and time consuming. Despite of all the efforts you exert trying to achieve the weight that you desire, you can never see the results without the right kind of foods that will help you build muscle mass. There are cheap weight gainer foods and supplements are just around the corner. You just need to learn what is the best weight gainer that suits your needs and how to make it all turn out effective. In building muscles, all you need are nutrient dense, muscle building foods that will help you store all proteins and calories you need to gain muscle mass. 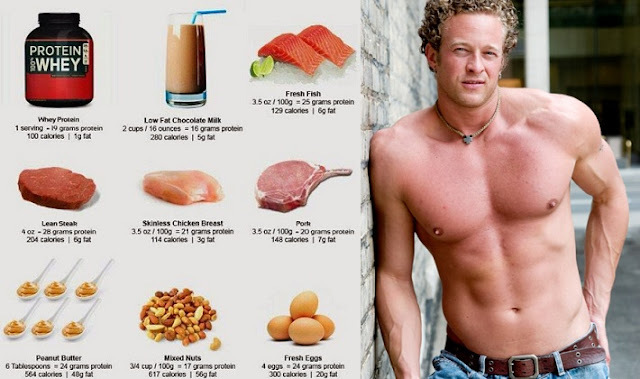 The best weight gainer with the cheapest cost includes basic foods that we eat everyday. Eggs are known to be the richest source of protein and fat. It has about 5-6 grams of protein in each egg which is very cheap compared to other weight gain foods that costs more than just the price of one single egg. The yolk contains monounsaturated and polyunsaturated fats that are both good for the body, half of the egg’s protein and essential amino acids and vitamins that are not found on the egg whites. Ground beef are better than whole lean meat because it contains 6-7 grams of protein per ounce of raw ground beef. Its fat contents depend on the leanness of the meat but it is certainly cheap as a weight gainer food for the body. However, many individuals may be concerned with large amount of fat found on ground beef. You can easily make it leaner by browning the meat which reduces the cholesterol and fat. After this you can run water over the ground beef so the fat will be washed out. Some might even want to eliminate more fat by pouring the meat on to paper towels which absorbs grease left from the straining process. It will definitely leave with nothing more but healthier, leaner meat that will be perfect for your muscle building needs. Whole milk is very popular among bodybuilders. It has 8-9 grams of protein and fat per cup and is a standard weight gaining food that focuses purely on muscle weight gain. A gallon has about 16 cups of milk which is very cost efficient for “hard gainers” and aspiring body builders. Peanut butter is one of the cheapest, easiest and most appetizing ways of bulking up. It has 6 grams of protein and 16 grams of monounsaturated fats per 2tbsp servings, a few tbsp servings with your sandwiches, protein shakes or oatmeal will definitely increase your calories and build up your muscles in no time. If you’re looking for a muscle weight gainer that is easy on the budget, you could try consuming foods that are high on carbs. Potatoes are ideal for a high carb diet and it is the cheapest weight gainer on this category. A medium sized red potato has about 25-30 grams of carbs that would easily help you build muscle mass faster. Oats is another great source of carbohydrates. A cup contains at least 50 grams of carbs and 6 grams of fiber. One great thing about oats is that it is extremely healthy. It helps in cleansing the body by promoting better digestion. There is a variety of commercialized oat meals that you can take anywhere you go, so it is more convenient and cheap for anyone who wants to do some serious bulking up. Most whey protein powders have 25 grams of protein per serving. While it is the most effective food supplements for individuals who desire to have big, hard muscles, it is also considered to be the cheapest in the list of protein weight gainer supplements around. Bananas provide a tasty variation among the high carb sources we have like potatoes and oats. A banana has 30 grams of carbs and can be easily combined with your favorite whey protein shakes or oat meal diet after a routine workout. This facilitates rapid digestion of carbs and proteins in the body thus making it a quick solution for weight gain and muscle build up. Olive oils are popular for health conscious individuals because it is the cheapest source of nutritious mono and polyunsaturated fats. It can be easily combined with salads or cook your egg, meat and potatoes using this extremely nutritious oil. Some individuals even add it on their shakes to rapidly increase their caloric intake. Canned tuna is making its name in the cheapest muscle building foods available in the market. Canned tuna has at least 25 grams of lean protein that is highly nutritious and delicious as well. There are commercial tuna packed in oil which is twice as many calories with just about the same cost as your regular canned tuna. Every muscle building individual must remember that food is always a priority among weight gain supplements because it offers more than just muscle building factors but healthy nutrients as well. You can always ask for expert nutritionists to help you find the right muscle building diet for you. If you only focus on cheap yet effective muscle building diet, you will surely achieve the big muscles and great body you are dreaming of.